What Do Israelis Really Think about the Iran Issue? Israel and Palestine: A One-state Solution or Two? If you are part of a national army that has to fight an asymmetrical war against a militant group in a densely populated urban area, how do you prevent civilian casualties? This is a question Israel had to deal with last summer, when it fought for more than seven weeks against Hamas in the Gaza Strip. Israel used a peculiar tactic to prevent civilian casualties: they considered them no longer to be civilians. According to a first sergeant of the engineering division that was stationed in Gaza City, the instruction was, “Any person you run into, that you see with your eyes, shoot to kill.” The area was bombed before his unit entered it, and it was assumed that citizens would have fled: whoever was still there was, by definition, suspicious. Last week, the Israeli NGO Breaking the Silence published this testimony, along with more than sixty others. Israeli soldiers, from privates to officers, spoke anonymously about their experiences in the most recent Gaza War, called Operation Protective Edge. The main conclusion to be drawn from the testimonies is that the Israel Defense Forces (IDF) value the lives of its own soldiers more than the lives of civilians in areas in which “the enemy”is operating. These statements are at odds with the official position of the Israeli army, which stated that it did everything possible to avoid civilian casualties. According to the UN, 2293 people died during the war, including 1492 Palestinian citizens. Certain rules, such as the distance the army tends to keep from enemy civilians when firing projectiles, were relaxed during the war. And in two cases, Shujaʾiyya and Rafah, they were abandoned almost entirely. In Shujaʾiyya, seven IDF soldiers were killed when a rocket hit their armoured personnel carrier, and there were (false) rumours that a brigade commander had been killed. In Rafah, Hamas attempted to abduct a soldier. In both cases, Israel responded mercilessly, firing hundreds of tank shells in just a few hours. 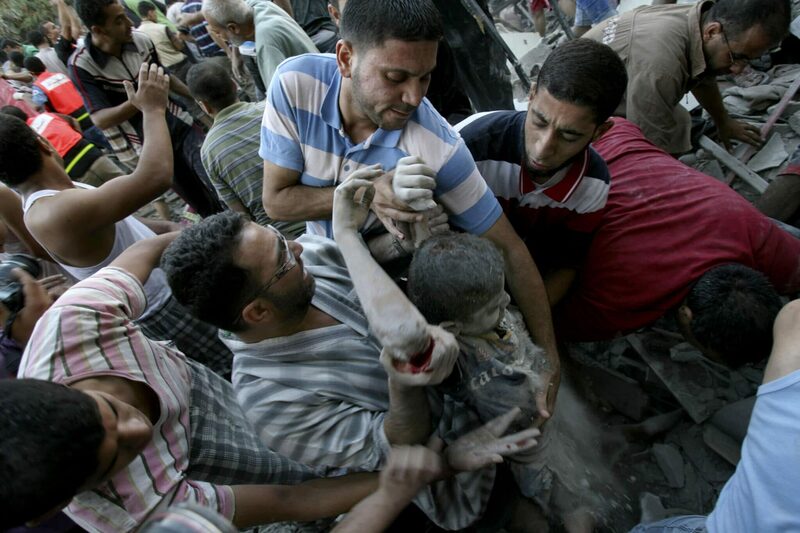 Between 130 and 150 Palestinians, many of them civilians, were killed in the IDF bombings in Rafah. The kidnapped soldier was also killed in this operation. It is difficult to tell whether Israel broke international law with these actions. Those laws can be interpreted flexibly, so there is always something Israel can justifiably say in its defence. According to Noam Zohar, professor of philosophy at Bar-Ilan University in Ramat Gan, who specializes in the ethics of warfare, a war is always about weighing risks. “The army does not need to take extreme or suicidal risks in order to prevent civilians being harmed.” But there are Israeli commanders, he says, who want to avoid any risk to their own soldiers. As a result, there will inevitably be civilian casualties. Zohar emphasizes that Israel tries to live up to “very high” moral standards. “We are not talking about war crimes here. Israel doesn’t behave any worse than, say, the United States or the United Kingdom did in Afghanistan,” but Zohar does think the IDF should do more to investigate every civilian casualty. A spokesman for Breaking the Silence pledges that the soldiers’ testimony is checked in every possible way and that questionable stories are not published. Last year, a settler named Oren Hazan, who was elected two months ago to the Knesset for the Likud party of Prime Minister Netanyahu, tried to deceive the organization with false testimony. His goal was to expose the lies of “extreme leftist organizations.” The researchers of Breaking the Silence found that, contrary to his assertion, Hazan had never served in Operation Protective Edge, let alone as a paratrooper. Fanack is an independent media organisation, not funded by any state or any interest group, that distributes in the Middle East and the wider world unbiased analysis and background information, based on facts, about the Middle East and North Africa. The website grew rapidly in breadth and depth and today forms a rich and valuable source of information on 21 countries, from Morocco to Oman and from Iran to Yemen, both in Arabic and English. We currently reach six million readers annually and growing fast. In order to guarantee the impartiality of information on the Chronicle, articles are published without by-lines. This also allows correspondents to write more freely about sensitive or controversial issues in their country. All articles are fact-checked before publication to ensure that content is accurate, current and unbiased. To run such a website is very expensive. With a small donation, you can make a huge impact. And it only takes a minute. Thank you. Stay up to date with the weekly newsletter!